Even the busiest, most fast-paced New Yorker will fall under the relaxing spell of an afternoon tea at the Orangery at The Whitby Hotel. 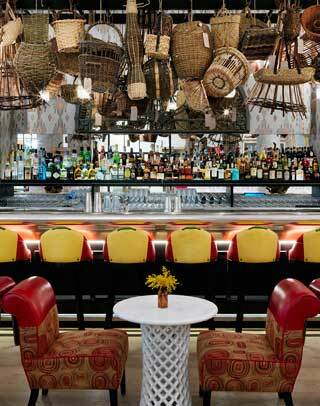 The Whitby Hotel is the newer of the two Firmdale Hotels’ properties in New York City. The first hotel being Crosby Street Hotel, which also serves afternoon tea. 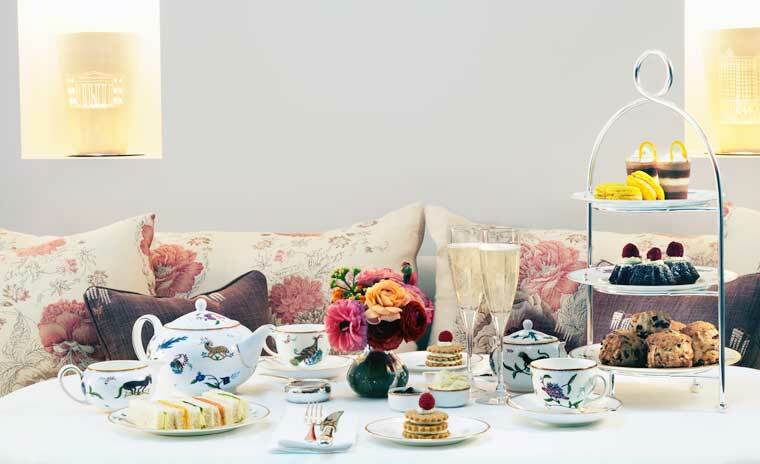 Kit Kemp, founder and designer of London based Firmdale Hotels brings a bit of London’s tea culture again across the pond at The Whitby. The hotel is located near the iconic shops of Fifth Avenue and is within walking distance to the Museum of Modern Art (MOMA) and Central Park. After spending some time shopping in the packed and tourist filled shops, going into The Whitby’s Orangery for afternoon tea is a necessary haven. Just like the Crosby Street Hotel, The Whitby is especially notable because of its interior design. When entering the hotel for afternoon tea, you’ll first walk through The Whitby Bar & Restaurant. You can choose to have tea there. The restaurant also serves all meals throughout the day, or you can opt for The Orangery, tucked away in the far corner of the restaurant. An orangery is traditionally a place where orange trees were grown, in a protected environment to withstand cold weather. The Whitby’s Orangery lives up to its name with orange walls and lots of plants on the tables, against the walls and even in the designs of the comfortable and colorful chairs. Looking up, natural light floods through the room with its skylight windows. It was a calm Friday afternoon. Families who looked like they were visiting the city were having lunch. Casual business meetings over a late lunch were in session. And afternoon tea goers like myself were in for a treat. Three varieties of tea are offered including a Bespoke English Breakfast Blend, Rare Earl Grey and Whole Chamomile Flowers. 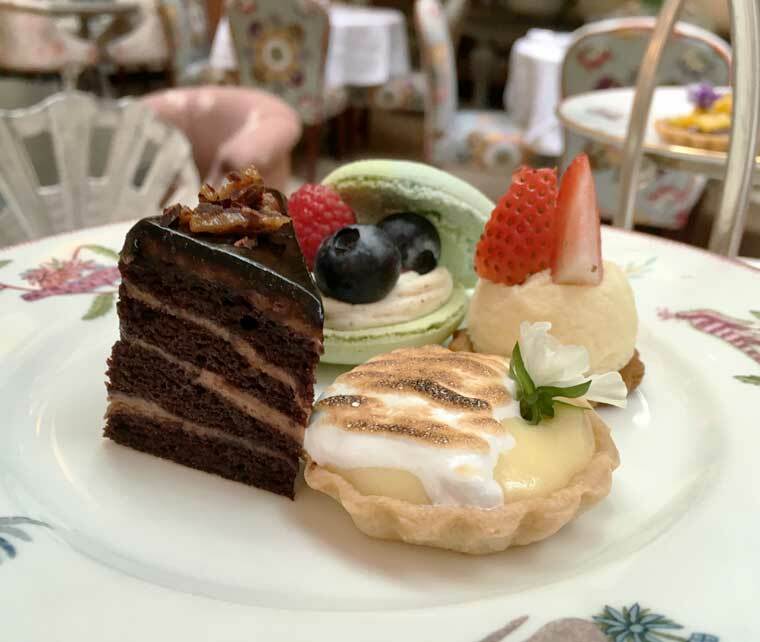 These are included with each afternoon tea package, but another wide selection of specialty teas like Darjeeling, oolong, herbal and rooibos, are also available for a supplement. Also for a supplement is a selection of champagnes to choose from. I opted for a tea, the Bespoke English Breakfast Blend, which I also had at the Crosby Street Hotel. 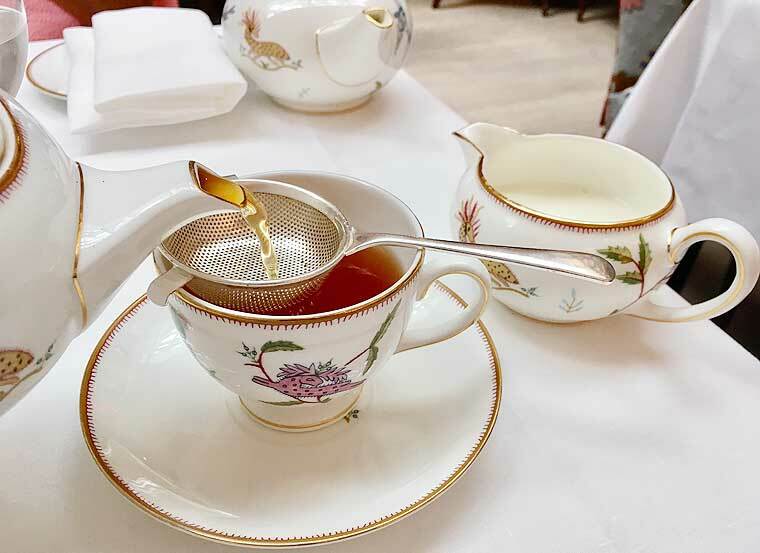 One of my favorite parts about having afternoon tea at a Firmdale Hotel is the special collection of Wedgwood tea ware that is used. The beautiful collection of plates, tea pots and tea cups were designed by Kit Kemp in collaboration with Wedgwood, called Mythical Creatures. It’s a cute, whimsical design that matches the overall look of the Orangery. My tea came in one of those Mythical Creature tea pots. And shortly after sipping my breakfast blend, the treats arrived. 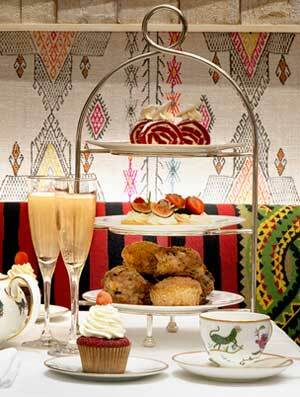 There are two afternoon tea packages available at The Whitby. There’s a traditional and a ‘healthy’ (gluten free) package. Both packages arrive with warm scones wrapped in a cloth napkin. 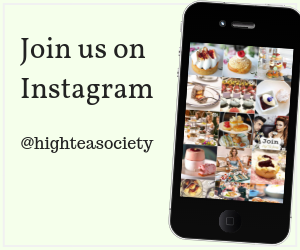 While I enjoy a traditional scone with clotted cream and preserves, I especially enjoyed and recommend trying the healthy afternoon tea package’s scones with cashew cream and preserves. It’s gluten free and the cashew cream is a delicious healthy alternative to clotted cream. As for the savories, the traditional afternoon tea package had some fun bite sized items like a beef slider and empanada- a nice break from traditional cucumber sandwiches. 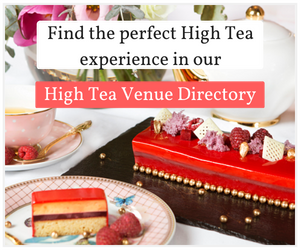 Meanwhile, the healthy afternoon tea includes vegetarian options with beets, cucumbers and avocado as some of the ingredients you’ll find in these bite sized fares. Also, there’s a nice range of desserts in both packages, from chocolate to fruity and sugary mini tarts and cakes. While these were all enjoyable, the best were still the scones in the healthy afternoon tea package. 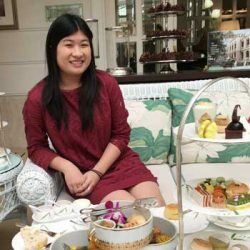 While taking time to appreciate the tea and food, I also took time to think about how relaxing the ambience of the Orangery feels. This spot for afternoon tea checks all the boxes for a place you’d never want to leave, or at least take some time to enjoy afternoon tea. Both are served with tea.